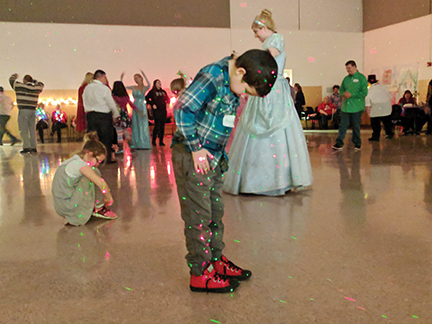 Hunter Dreczyn is doing the robot and keeping the dance floor alive at a holiday dance held Dec. 1 at the Westgate Community Center. 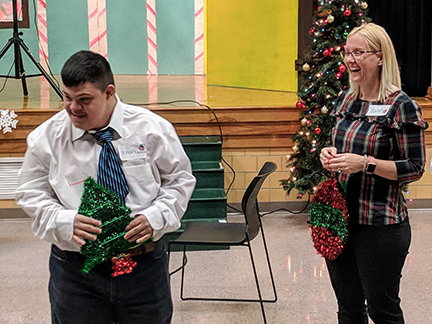 The West Columbus Civitan Club and Westgate Community Center sponsored the dance for individuals with special needs. Dreczyn also attended the inaugural dance last year. The attendees at the holiday dance gather for a group shot with The Royals Project, a non-profit group of volunteers who play the roles of Disney, Marvel and DC characters at local events and organizations. Josh Johnson receives an ornament he won in a drawing as the dance came to a close.